The Health and Educational Relief (HERO), is a U.S.-based 501(c)3 tax-exempt, not-for-profit organization providing quality health care and humanitarian assistance to communities of need. 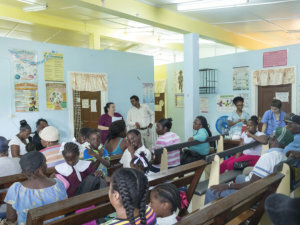 Since its inception in 2000, HERO has conducted annual medical missions to numerous Caribbean and South American countries where our volunteer physicians, surgeons, nurses, pharmacists, nutritionists, and allied healthcare professionals have directly administered quality care and support to thousands of residents in under-served communities. All services, including the dispensing of medications as needed, are funded by volunteer contributions and delivered at no cost to the patients. Among countries served by our previous medical missions are Guyana, Grenada, Antigua and Barbuda, Haiti and Jamaica. HERO typically conducts two overseas medical missions annually; the tours are undertaken in March and August, each lasting for approximately seven days. Mission volunteers are divided into teams and each team is assigned to a specific region of the country for the duration of the tour. In addition to our licensed professional clinicians, each team is also supported by student volunteers enrolled in pre-medical and other healthcare programs at accredited colleges and universities in the United States. The students are selected in a rigorously competitive process. The majority of our medical missions are conducted in remote villages and rural communities where the need for service is often exceptionally acute. However, since the description of “medically under-served” can sometimes be applied to an entire country in the developing world, our teams often administer services in urban centers as well. While on tour, our medical teams also work collaboratively with local providers to share professional best practices and ensure continuity of care. To learn more about our medical and other missions, and/or to volunteer, click here for additional details. The HERO Vision Improvement Project is the most recent addition to our inventory of services offered during our annual medical and humanitarian missions. The program was launched in 2015 in response to a growing need recognized by our frontline medical providers in the field. For some time prior to the formal establishment of the project, volunteers had provided glasses on a limited basis to those in need at our medical outreach sites. However, the Vision Improvement Project now enables us to move significantly further into the arena of comprehensive vision care. Since the inception of the project, our specialists have performed more than 500 vision screenings and eye exams and provided fully tested and adjusted prescription glasses to more than half of those individuals as needed. Nutritional counseling was also provided to those at risk of collateral vision complications arising from chronic conditions such as diabetes, and referrals were offered as warranted to those requiring ophthalmological interventions for anatomical abnormalities of the eye. Our goal is to continue building the program to provide not only prescription glasses but also to perform corrective surgeries and other interventions as needed for individuals with various forms of visual impairment. Keep your eye on this page for other exciting developments in this newest and rapidly expanding area of our humanitarian relief effort. From 2009 to 2013, the Literacy program was hosted at various locations within Sophia and Den Amstel with an average enrollment of nearly 300 students each year. In 2010, Mr. KenrickCort, the Director of Education for HERO, initiated a training program in Guyana for teachers and also introduced an annual evaluation of incoming students, using the WADE methodology, to determine their level of proficiency and to monitor their progress throughout the program. On the basis of those assessments, we are proud to report that students participating in our education program have made significant and consistent progress and have continued to excel in school.